A new national survey of 8,020 citizens reveals what mining means to Australians. While most Australians accept mining and think it makes an important contribution to our economy, they hold low levels of trust in in the industry and don’t feel they have a voice in shaping the industry’s practices. Mining in Australia is not only a significant contributor to our economy—it’s our biggest export earner today. But, this big business is not without its problems. 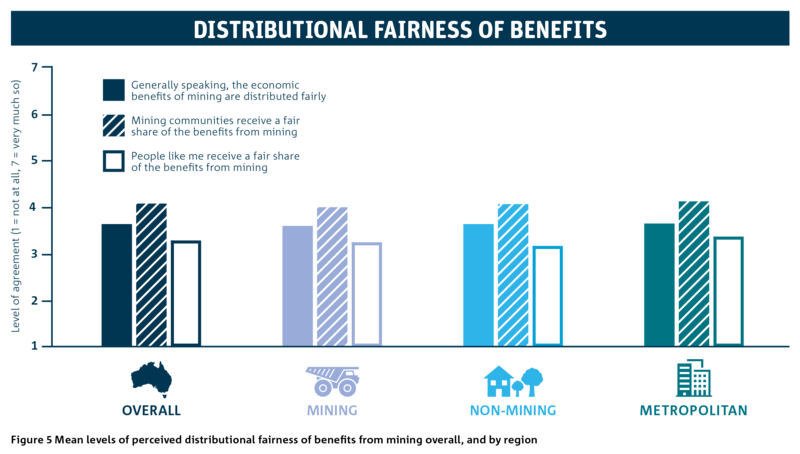 The relationship between mining and society is complex and has not always been easy. As community expectations grow, it’s critical for the industry to show it has a ‘social licence to operate’ not just with communities it works alongside, but with society more broadly. In a new report released today, we surveyed 8,020 Australians on their attitudes toward mining to reveal what mining means to citizens across the nation. The work aims to bring the voice of Australians directly to the table for a more constructive conversation around how to manage our resource base. Overall, most Australians accept mining and hold positive views about its contributions to the nation’s economy. Australians perceived mining as similarly important whether they lived in mining regions, non-mining regions or metropolitan areas. 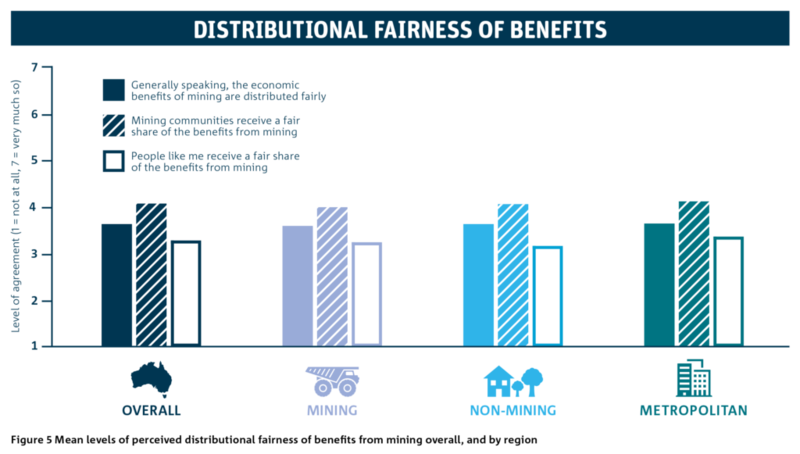 The top perceived benefits—job creation, employment opportunities and regional development—were found to outweigh the top perceived negative impacts to the environment and water quality. 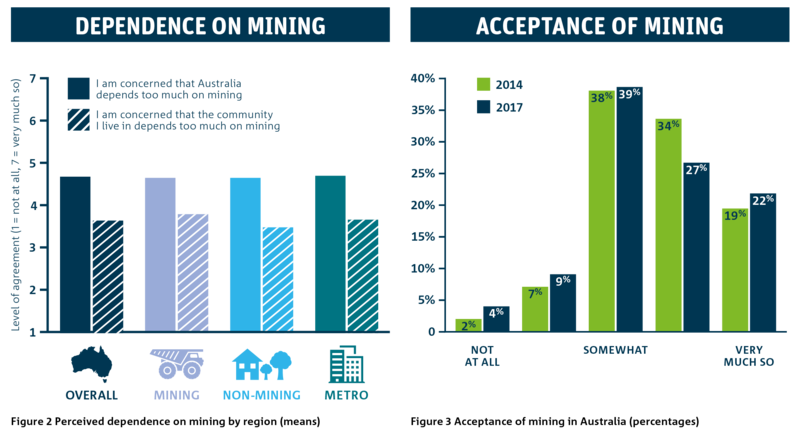 Participants perception of Australia’s dependence on mining versus their acceptance of the industry. Where Australians are less favourable is on trust, issues of fairness, and confidence in governance. Respondents held low levels of trust for the industry and the governance surrounding it. They felt they didn’t have a voice in shaping the industry’s practices. In this research, procedural fairness refers to whether individuals perceive that they have a reasonable voice in decision-making processes. Three-quarters of respondents reported that mining companies should gain local community consent before development. There is growing recognition that you can build trust and acceptance through the decision-making processes, the way the benefits of mining are shared amongst society, and the role of governance arrangements. The challenge is that trust in institutions is low across the board, but there are some very tangible and practical ways that mining companies can improve their social performance. For example, on-the-ground work using our Reflexivity solution helps mining companies better understand what their communities think of them and why—providing clear opportunities for responding and building greater trust in those relationships. Through community surveys, individuals can engage with a company on an ongoing basis and in near-real time. We act independently, collecting the data and analysing it before reporting it back to the community and company. Companies can then act on the issues to build trust, making the communities feel heard. 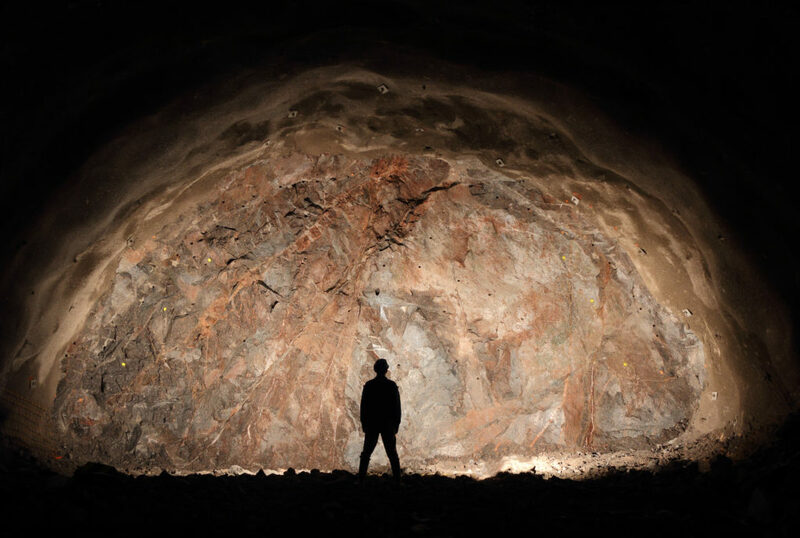 Reflexivity goes beyond a simple summary of community insights, as it builds upon knowledge gained from surveys such as the National attitudes to mining survey, and similar studies conducted overseas. By examining what citizens think about the impacts and benefits of mining, and the relationships that exist between the mining industry, governments and society, we add a new perspective to conversations about how mining takes place in Australia. These data provide deeper insights into building greater trust and earning a social licence to operate. Explore the key findings or download a copy of the Australian attitudes to mining: 2017 results report. I agree with Megan’s view. Mining represents a failure of sustainability, for which resources must be reused and recycled indefinitely as human population and consumption continues to grow. All metal processing involves greenhouse gas emissions, for smelting, alloying, heat treatment and fabrication. So inevitably does recycling but less so by starting with reduced material. Each tonne of iron ore for example requires the oxidation of over 4 tonnes of coal just to smelt it, releasing over 12 tonnes of CO2. Is it possible to have a state by state breakdown of the survey results? In theory, WA and Qld are the two states with a larger economic share from mining, especially compared with Victoria and Tasmania. If the low trust of mining is reasonably similar in WA and Qld, then the industry certainly has an image problem that needs to be addressed. Results haven’t been broken down state by state, but if you download the report you can see a breakdown of results for each question by mining region, non-mining region and metropolitan areas. I guess I’m following on from the question above – It seems that most people who responded to the survey had low knowledge of the mining industry. That could well be representative of most Australians – but there seems to be no allowance to establish whether the participants have a willingness to consider long term implications from the mining industry (and perhaps state their preference to an alternative industry). For example – Would you rather see a new coal mine in the Hunter Region benefit the local community or a Wind farm? The survey has a short term perspective – ie immediate employment, infrastructure and economic benefits. There seems to be no lead in to an explanation or consideration of climate risk – which is now inherent (or should be at Government level) in any mining project – and we know the costs of climate change will be high. Even if the wider community has no understanding of climate risk – wouldn’t that be a good thing for the CSIRO to monitor, as surely the Government has a responsibility to monitor climate change impacts? Did the CSIRO receive any funding from the mining industry in preparing this report? The research project was funded by CSIRO, with some additional funding from the Australian Government Department of Industry Innovation and Science that allowed us to extend our data collection.